If you’ve followed our blog for more than a year, you’ve likely noticed I tend to fall silent in the blogosphere every March. Admittedly, I don’t do this on purpose; in fact, I actually strive to defeat this trend every year and vow to do better next time. And yet, here we are again, the first week of April and I’ve not posted a single thing since mid-February. When I lived in more southerly climes, my “March” was actually February, but the effect was still the same. The weather stagnates and takes your mind with it. Winter — its body in traction, weakened by the approach of spring — litters the landscape with damp hankies, puddles, and unsightly debris. Spring — the sneaky victor — creeps along in the background, tidying things at a pace almost imperceptible to winter weary eyes. Meanwhile, from his death bed, winter is boring you yet again with another long tale of ice and cold — the magic of which is now completely lost on you after so many repetitions. And, of course, there’s the man-made tyranny of Daylight Saving Time to contend with. The sandman, himself, coming to tax your mind, exacting from you an hour of slumber in exchange for nothing so early after the spring equinox. I still assert Daylight Saving Time is a delusion put in place to please the impatient — an argument I hold onto as tightly as my extra-large mug of coffee while staring out into total darkness on a Monday morning in DST, knowing somewhere else in the world someone’s smiling at the sheer novelty of enjoying dinner before the sun has gone down. Meanwhile, I’ll be lucky to be conscious by dinner! Fighting off a March hangover, this year, has been no less a challenge than in years past. 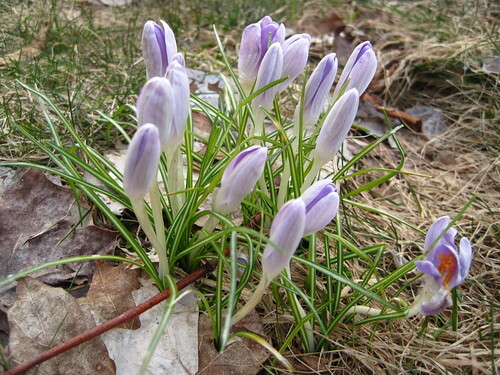 James and I have been doing our best to celebrate each and every tiny sign of spring we manage to spot — the little patch of crocuses on the front lawn, the heroic blades of grass popping up at the edge of the woods right in front of the foot-and-a-half snow embankment. I’ve also been busy working on various indoor projects since the outdoors are famously inhospitable this time of year with winter and spring carrying on simultaneously. This winter has been a particularly fruitful period for me in the sewing room. Since late-November, I’ve completed 3 projects. You can read about one of them on my Other Exploits page. My most recent one — my largest project to date — is a throw for our living room sofa. Since our living room is full of windows, the outdoors determines our color palette as much as our furniture. With that in mind, I had James help me pick out a color scheme that would fit in our living room no matter the season. The pattern I chose was called “Bits & Pieces.” Thankfully, I managed to use lots of small bits of fabric that I’ve collected over the past few years. Of course, as is the way in quilting, I also managed to acquire some new fabric in the process. Now that it’s done and all the patches have been sewn into place, I can see it’s the perfect size for a generous throw — large enough that you can completely wrap yourself up in it without worrying about your feet being neglected. Plus, it’ll help protect the back of our sofa from wear and tear — especially since our giant, orange cat (Ollie) has annexed it as his own territory. Of course, since I only have a regular-sized sewing machine and I’m a novice quilter, I’m not going to attempt to quilt this giant thing on my wee machine. I’m in the process of finding someone with a longarm quilting machine to make fast work of the finishing touches for me. 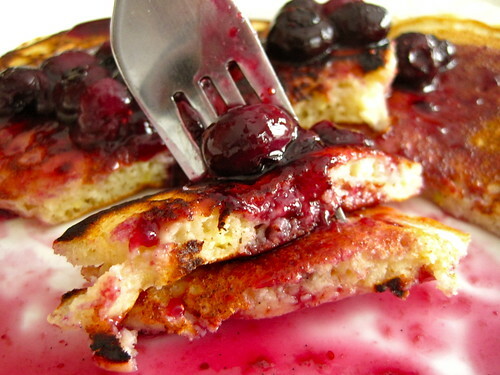 Meanwhile, I’ve kept busy in the kitchen tinkering with various new recipes and trying some new things like these tasty pancakes we had recently; but I’ve not really hit on any recipes that sparked my excitement enough to blog about them. Instead I’ve made notes for improving and vowed to return to them at a later date. This might be owing more to my March “hangover” than the actual results of my cooking! Lastly, our little greenhouse room is at last housing a few seedlings. It does feel strange to be mixing up germinating mix and planting seeds when there’s almost no visible soil to speak of, outside, but spring is already upon is. We’re looking forward to sweeping off the front porch, sitting in the shade of a sunny May afternoon, listening to a cool breeze sweep through newly green leaves in the surrounding trees. 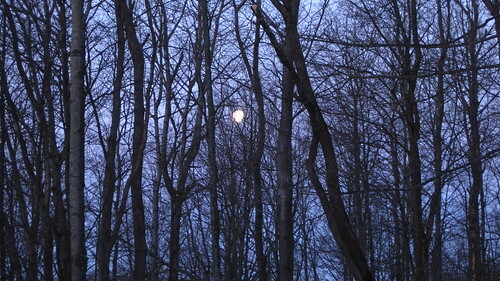 These sluggish days of early spring will seem a distant memory by then. ~ by Jason on April 4, 2013. Your writing style Jason is so … descriptive. Love it just love it! Thanks for reading, Bob & Teddy. 🙂 When you’re cooped up by the grey and the rain, it’s amazing the descriptions you have time to come up with! The quilt looks fantastic! And I’m with you about March. March is my birth month but I have to agree with you…it’s a mixed bag. I’ve spent time staining & varnishing, reading, and planning my sewing project for a porch valance. I should get your opinion on my plan. It may have some flaws. As always, love your blog. I didn’t realize you were a March baby, Sue. I’m sure it complicates your perspective on March as much as my being born in July complicated my view of summers in South Louisiana. Of course, not only was it unbelievably hot and humid, it was also the height of hurricane season and when my father (and lots of my other family members) were away on the shrimp boats. Good times! I don’t think I realized you did any sewing — how exciting! I’ve haven’t made any curtains/valances, yet, but I do have my sights set on making tablecloths. Did you come up with your pattern on your own or did you customize one you found? I think that’s probably one of the more frustrating things about quilting or sewing: pre-existing patterns are never quite what you need and always require tweaking. I created the pattern myself..no big deal. Actually, I used to sew alot. Have made coats, a man’ suit…a long time ago. 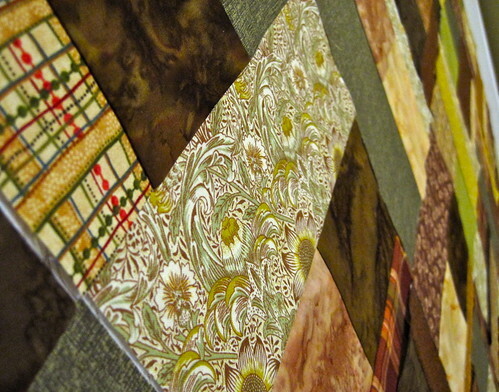 If you don’t want to try your own quilting, try Quilting Bee in TC, on Airport Drive. Quilt-n-Bee is one of the stores I contacted for longarm quilter references. They were able to give me some contact information for about four different places, but no one (including the folks recommended by Interquilten) has a website up. I hate “cold calling” people — especially when I know I’ll have a lot of questions and may not be able to understand the answers. In the meantime, I’m visiting the websites of longarm quilters from around the country and learning about the terms they use, the way their pricing usually works, and what sorts of prep work they may require of me. I combat the same psychological block that we both have with a joyous, hopeful celebration of March 1st as “The Psychological First Day of Spring.” Once I get to that date I KNOW that the changes of Spring are very close. It’s usually during the month that, if you watch and listen carefully you will see the small signs of the approaching break from winter. I tell myself that since I managed to get thru November, December, January, and February and so March will be a piece of cake to handle. I definitely agree. 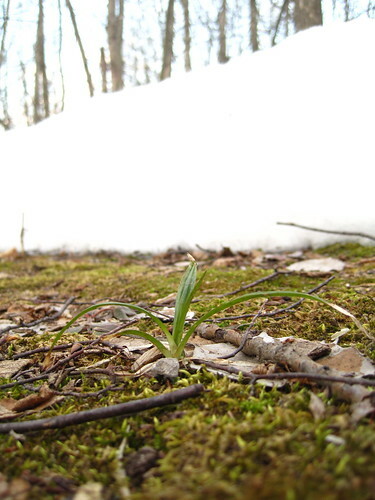 Even with this winter being (thankfully) a more typical winter in Northern Michigan, March seemed to bring on very noticeable shifts in the weather patterns. I guess it’s the snail’s pace that be taxing, at times. I’m grateful for the seed starting busyness, though. My green thumb is mighty itchy by mid-March. Looks terrific! 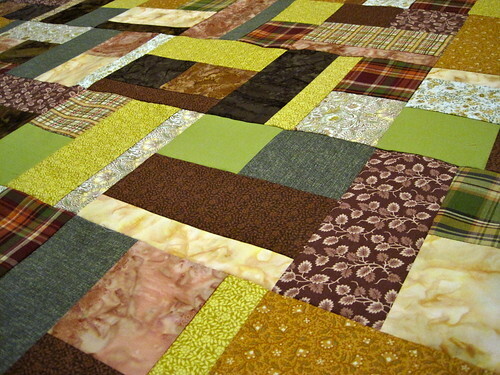 Never really saw a masculine quilt before, and yet, here it is. Try a quilt shop, they should have contacts. 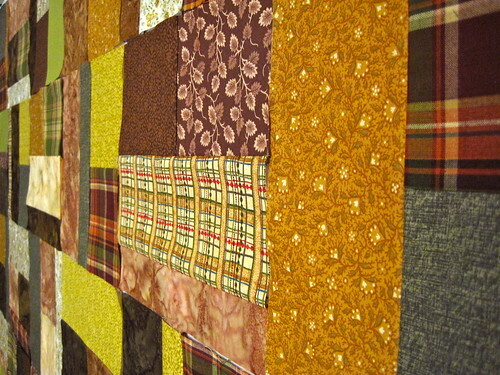 Otherwise, I know a person who has done 2 of my quilts in Belvidere if that could possible work. U just have to find the stitching pattern u like and she can do it. Thanks! We were definitely shooting for masculine. 😀 I did get a list of contacts (a surprising number of people around here are longarm quilters, apparently), but I’m hesitant to just call them up when I have all these weird questions (and I hate the telephone). None of them have websites, so I’m doing as much preliminary research as I can. I’m just going to have to call one of these people and hope for the best, I guess. Wouldn’t it be awkward to show up at their house and then realize you don’t like any of their work?! So you say you more or less picked out a quilting pattern before going to the lady who did your quilting? LOVE the quilt, Jason! …and the pancakes 🙂 I hope it stops snowing up here quickly, I’m ready to go outside!!! We are monitoring the dwindling snow piles several times a day, around here! I love your throw Jason! Great job! 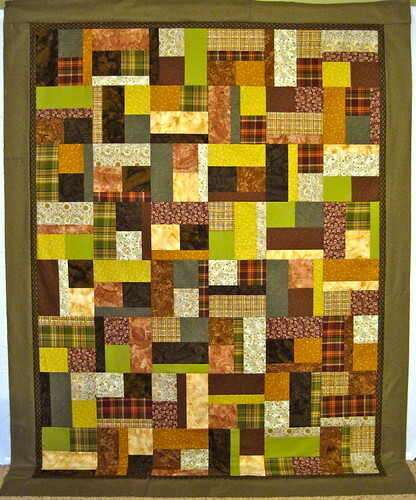 The plaid works perfectly and plays so well with the other fabrics. I’m excited to read & see more of your blog.